Chicken, Bacon and Cream Cheese. Three of my favorite ingredients. Who are we kidding, three of everyone’s ingredients. 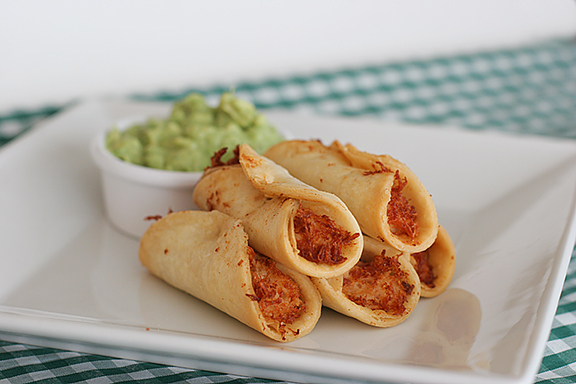 Put them all together and you’ve got this taste-bud tingling recipe Chicken, Bacon & Cream Cheese Mini Taquitos. I’m already thinking up a million reasons to make and serve these. If you’re planning a Super Bowl Party you should certainly add these to your menu. Or just make them for lunch, dinner, whatever excuse you can find. Check out Taste and Tell’s other ideas for Super Bowl additions! 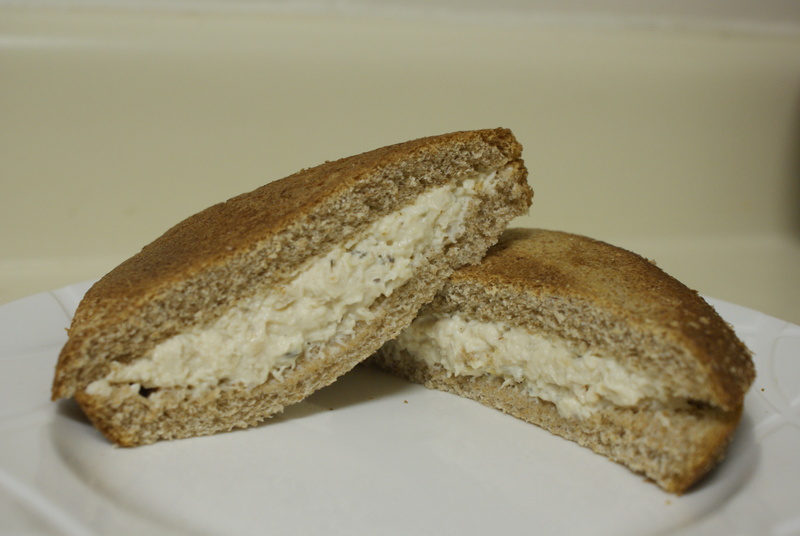 One of my favorite summer meals is a chicken salad sandwich with a tall glass of classic lemonade. And with this being one of the hottest summers ever, I’ll take every refreshing meal I can get. Growing up, my mom always made a very basic chicken salad. None of that celery or grape stuff, just good ol’ chicken. I’ve added a few spices here and there over the years. It’s an easy treat to whip together whether you eat it with crackers or as a sandwich. Rub the chicken with rosemary, italian seasoning, garlic pepper and garlic salt. For a nice deep flavor let the spices marinate over night. Grill the chicken the next day, I use my George Forman (one of my favorite kitchen appliances). Let the chicken set to cool, this also helps to keep the chicken juicy with all those spices. Once cooled, put the chicken in a food processor until all chicken is shredded into small bits. In a bowl mix chicken with mayonnaise and Durkee’s sauce. Add more garlic pepper and garlic salt to taste. Did you know there are food categories other than dessert? My overwhelming sweet tooth prefers to ignore these categories, but last week I stumbled upon a blog that has me excited about getting in the kitchen to cook some dinner. This is a big deal. I’m never excited about cooking dinner. So, the fact that I’ve picked out more than a few meals from Cassie Craves is a proud moment. 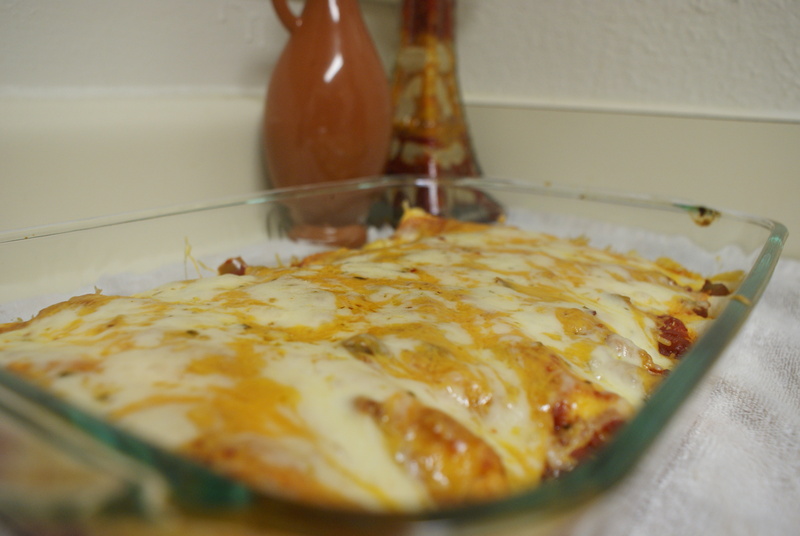 It all started when some of my Twitter world was chatting about chicken enchiladas. What can I say, those little tweets can be a dangerous world of cravings. 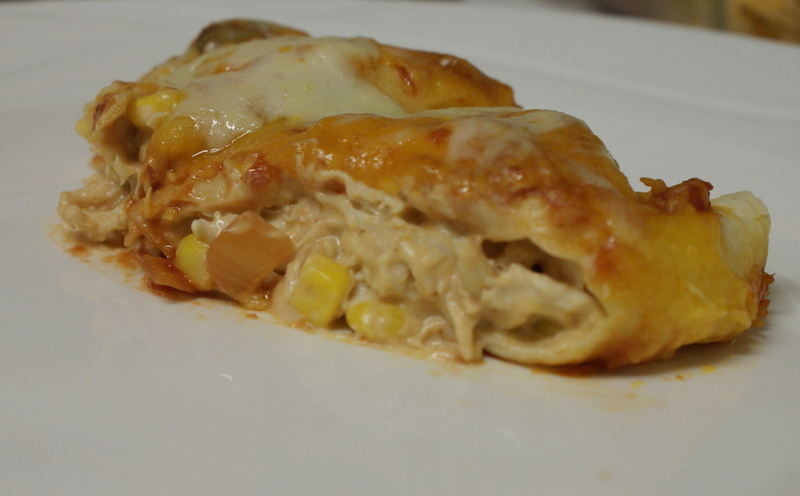 Cassie’s Cream Cheese Chicken Enchiladas won me over. Her photos coupled with the ingredients were a complete win. This meal was a creamy mexican delight. I followed her recipe word for word this time around, but next time I’ll make a few changes. Having the perfect salsa is very important for this meal. The salsa I used was a little too chunky for my liking, so searching for a different sauce is going to be necessary. And seeing as I love spicy food, I’m going to use 1 tsp chili powder and 1/2 tsp cumin. Also, the addition of rice either as a side dish or in the actual chicken cream cheese mix will definitely be incorporated. This is one recipe you’ll wake up craving in a couple of days, trust me. In a medium bowl cream together cream cheese and sour cream. Stir in 1/2 cup salsa. Stir in 1/2 cup of each type of cheese. In a second bowl toss together the chicken, corn, cumin, chili powder, salt, pepper, and half of the scallions. Add the chicken mixture to the cheese mixture and stir to combine. Spread about 1/2 cup salsa in the bottom of a baking dish. Place 1/3 to 1/2 cup filling on a tortilla, roll up and put in dish seam side down. Repeat process for remaining tortillas. Pour remaining salsa over enchiladas, spreading to coat all of them. Sprinkle with remaining cheese. Transfer to preheated oven and bake 20 to 25 minutes until hot and bubbly. Sprinkle with the remaining scallions and serve warm. The Cupcake Cure by Erin Bridges is licensed under a Creative Commons Attribution-NonCommercial-ShareAlike 3.0 Unported License. Permissions beyond the scope of this license may be available at https://thecupcakecure.wordpress.com/.